This is the Front Crankshaft Seal for your B6-S4. Made by the Original Equipment Manufacturer (OEM) - Victor Reinz - this is the same part that came on your car from the factory. 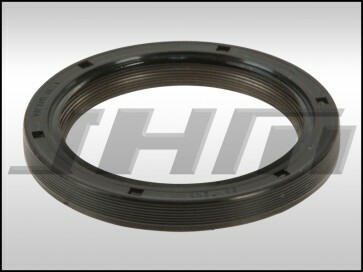 The OEM Part Number is 079 103 051 D.
This is the EARLY Crankshaft Seal for B6-B7 S4s with VINs up to 8E-4-163755. If your VIN is from 8E-4-163756 on, please see the LATE Crankshaft Seal which can be found in this same section. For reference, this EARLY Seal has an outer diameter (OD) of 70mm. Heard that you need an adhesive to install this such as loctite 4204. Is that what you guys use or can something easier to find be used to install these properly? Yes, the early style seal calls for Loctite 4204. You will also need to let it dry for 1 hour before running the vehicle.